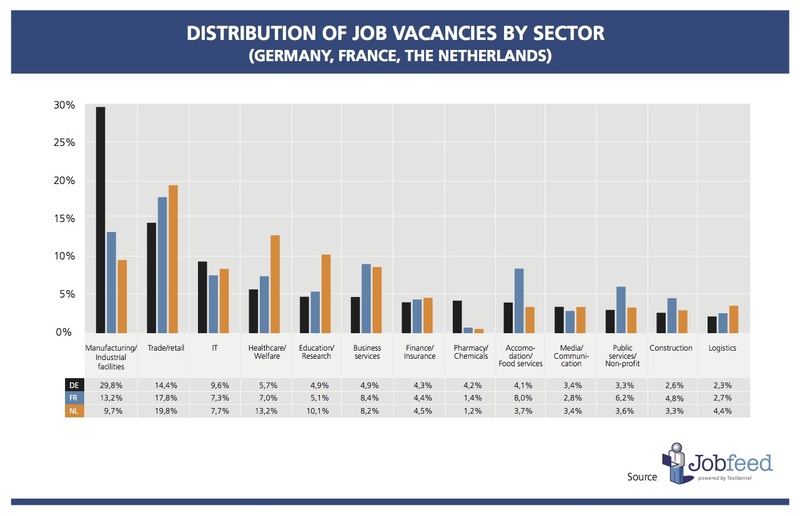 Earlier this month, Textkernel published its Q2 – 2014 index of the German, French and Dutch online job markets. This index is based on the analysis of millions of job postings published online in the second quarter of 2014 and collected by Jobfeed, the labour market analysis tool of Textkernel. By comparing figures from Q2-2014 in those three countries the following observations can be made. 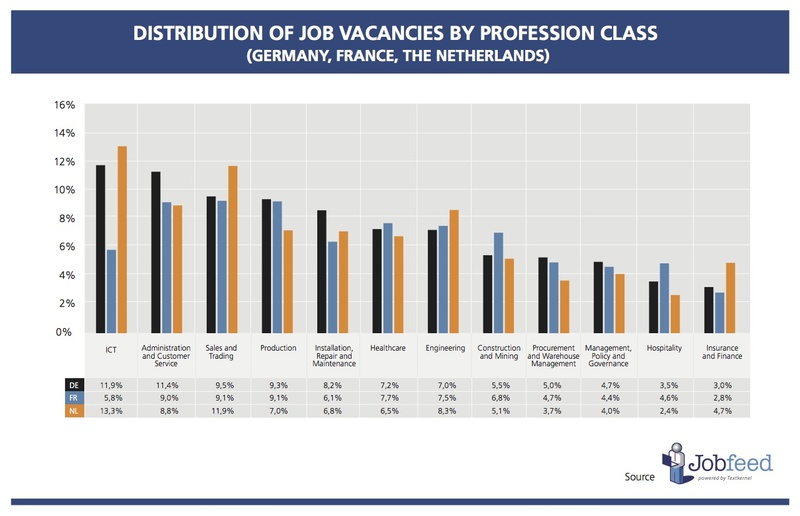 While it occupies the top spot in both Germany (11,9%) and the Netherlands (13,3%), ICT is only the eighth largest profession class in France accounting for 5.8% of all online vacancies posted in Q2 2014. Sales and Trading is the number one profession class in France (13,4% of all online job vacancies) and is also among the largest categories in Germany (9.5%) and the Netherlands (11.2%). Over the past 12 months, Germany experienced a sizeable increase (+1.9%) in the share of the Administration and Customer Service jobs, its second largest profession class. This share remained relatively stable in both France (-0.5%) and the Netherlands (+0.2%). In the Netherlands, the share of Education and training jobs (3,3%) was twice as large as in Germany and France. In Germany, this profession class lost close to half of its market share in the past year. In Q2 2014, Germany’s top sector, Industry and Manufacturing, accounts for more than 30% of all online job vacancies in the country. This is more than twice as much as in France and three times the share of this sector in the Netherlands. In both France and the Netherlands, Trade and Retail is the largest employer, accounting for respectively 18% and 20% of all job offers in Q2 2014. The Dutch Healthcare sector (13.2%) hired in proportion twice as much as the French and German one. However, over the past year Healthcare sector’s employment in the Netherlands dropped (-2.4% share), while it remained stable in Germany (+0.6%) and France (+0.2%). Data also shows that the share of the Education sector is twice as big in the Netherlands as it is in Germany and France. With regards to jobs in the Accommodation/Food service sector, the gap widens between France and both Germany and the Netherlands compared to Q2 2013. In France this sector represent 8% (+1% in one year) of all jobs posted, about twice as much as in Germany and the Netherlands. Consult the full Q2-2014 report on the online job market in Germany, France and the Netherlands. For more information about Jobfeed and the online job market, contact Textkernel.